An implant fixture is a man made root. 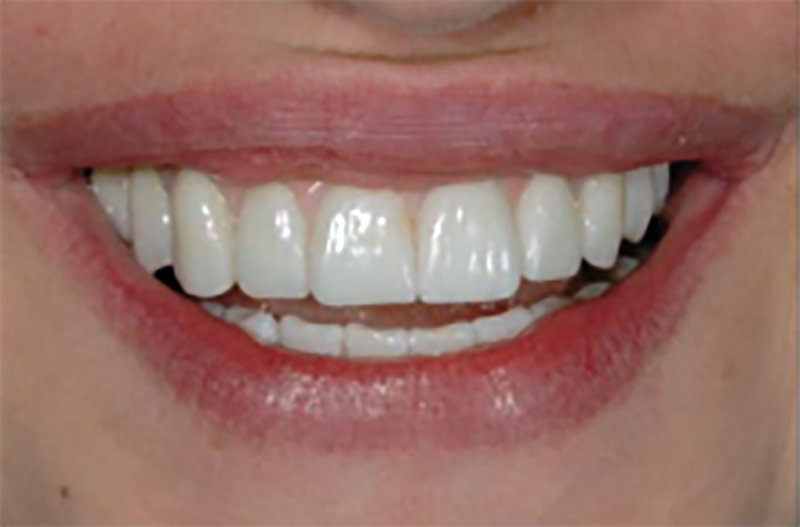 The use of implants in contemporary cosmetic dentistry is a great step forward in ultimate aesthetic dental care. Implants allow for replacement of missing teeth in the aesthetic zone without having to resort to removing tooth structure to construct a fixed bridge. if a single tooth is lost and adjacent teeth are totally unrestored and healthy or patient does not want to cut down teeth Fig1. FULL ARCH FIXED BRIDGEWORK: "Pretau" fixed implant supported bridgework is a zirconium constructed bridge which has both tooth and tissue replication. Properly positioned implants, with ceramic crowns placed over them, can perfectly mimic the natural tooth they replaced (Fig 5). 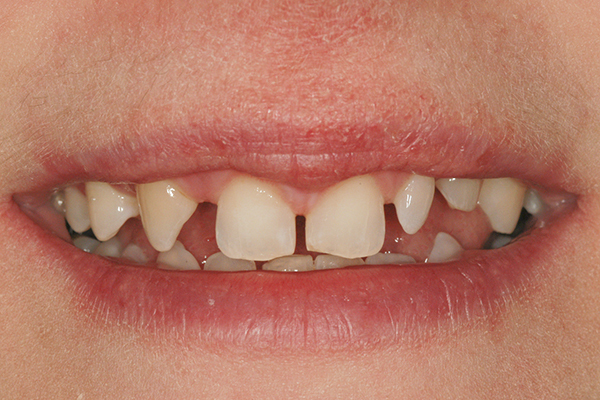 It may be a single tooth or multiple teeth (Fig. 6). They can all look, feel and function just like their natural counterparts. Dr. Prus himself had need of an implant 15 years ago in the front of his mouth when a single tooth fractured. It is still indistinguishable from all the other teeth in his mouth. Implants, when properly placed and cared for can last a lifetime. HEALTHY TEETH: Are the immediately adjacent teeth to the edentulous area totally healthy: no decay; no fillings, no periodontal disease, no fractures, and they are aesthetically pleasing. They would have to be cut down for a fixed, cemented bridge. AESTHETICS and CLEANSABILITY: If the missing tooth area can be aesthetically restored with an implant to mimic a natural tooth it is easily cleaned. 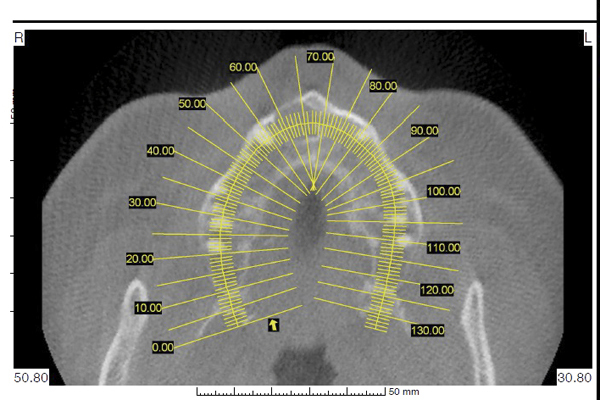 The issue exists if the smile line is high and shows the point where the implant comes out of the gums. The implant has to be ‘submerged’ far enough under the gum line to prevent the metal of the implant from showing as well as allow the attached crown to develop full tooth-like shape before it emerges from under the gums. It can then be cared for just like a natural tooth. The rule for multi-unit implant supported bridgework is it MUST be cleansable or it will likely fail due to bacterial contamination. Fixed bridgework, on the other hand, needs to be cleaned under the 'pontic' area, which poses a dexterity problem for some people and the margins must be submerged if it is has a metal base. The same rule applies for cleaning cemented bridgework. Zirconium bridgework matches tooth structure better for this situations. ADDED STRENGTH: Adding an additional man-made root (the implant 'fixture') will noticeably contribute to the strength of that area of the mouth (e.g. : the other teeth have bone loss). When a bridge is placed over a missing tooth, the two adjacent teeth to the space are then absorbing the chewing forces of all three teeth. If two teeth are missing, they absorb the chewing forces of four teeth, and so on. If those teeth are not strong, this may overload them, accelerating additional bone and tooth loss. Implants do the opposite; they strengthen an area. REMOVABLE BRIDGES (Partial Dentures): Removable bridges often have movement during chewing which also can damage the bone of supporting teeth. Multiple missing teeth can be restored by several implants and strengthen the remaining teeth in the mouth at the same time. This approach serves the mouth better in the long term. COST: Implants may be more expensive than alternative treatments. When insurance coverage is involved in the decision making, not all carriers cover implants as readily as crowns and bridges. This increases the proportional cost difference. 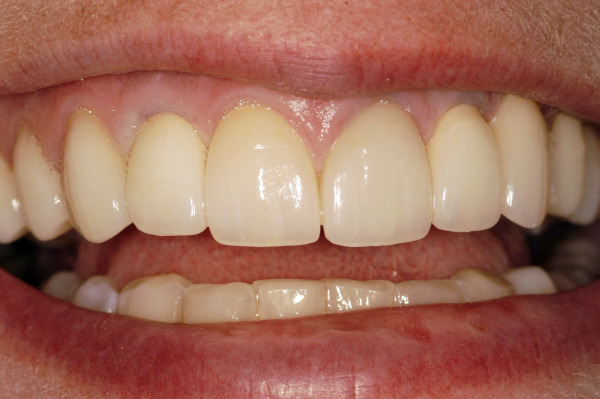 The cost must be balanced against the loss of tooth structure in making a cemented bridge. The process of placing implants is technical, especially when multiple implants are to be joined together. The margin of error in multiple implant cases is in the order of 5µ (microns). (MICRON=1/1,000 of a millimeter). 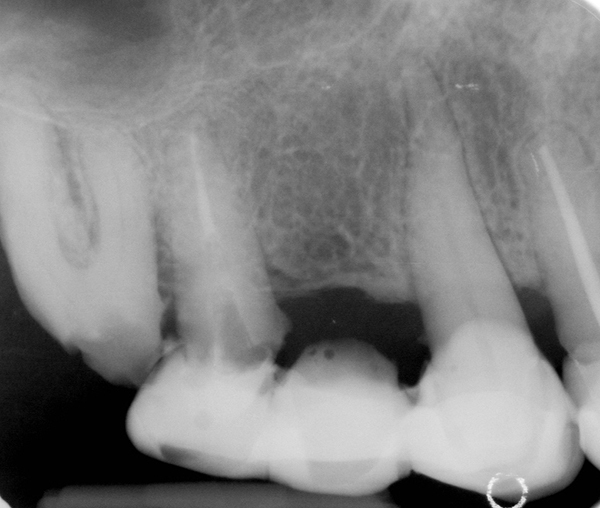 This risk is minimized by using CAD-CAM technologies and surgical guides to maximize accuracy. FUTURE COSTS: a major consideration in choosing to use implants is what money will be saved in future years if the implants are placed. With each implant potential future costs can be reduced because of the additional functional support they bring to the mouth. This may very well prevent the loss of natural teeth later on which can add compounded costs. PRECISION: Just like all things in life, there are levels of quality in placing implants. The most precise implants can last a lifetime. Poorly placed and functioning implants will fail rapidly or be a constant oral irritation. Dr. Prus takes extreme care to ensure every crown he delivers is a perfect fit. Fig. 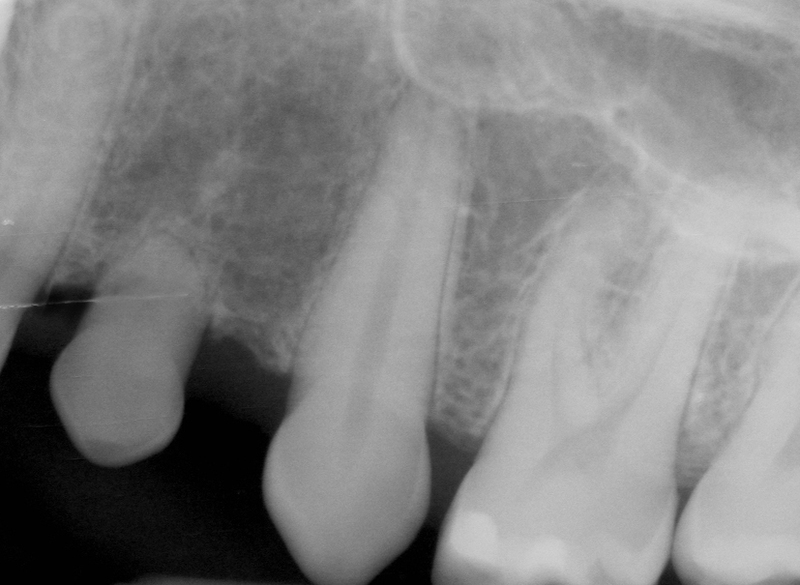 6 shows poorly fitted implant crowns which will lead to bacterial contamination, mechanical irritation and potential bone loss. Fig. 7 shows a properly fitted crown. 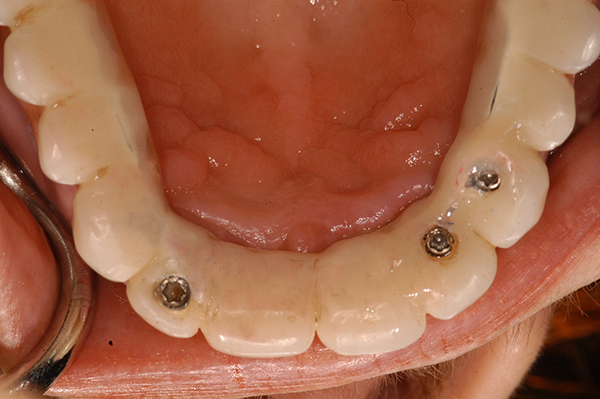 IMPLANT-REMOVABLE BRIDGEWORK COMBINATIONS: Because multiple implants in an area can be a more expensive alternative to regular crown and bridge work, but fixed bridgework may be technically risky, a good, less expensive solution may be to have one or more implants support a removable denture (partial = some teeth remain; full = no teeth remain in the arch). This eliminates the cost of making crowns on multiple implants, and still stabilizes and supports the chewing function of the removable prosthesis and takes pressure off the remaining teeth. All of the above considerations enter into the decision making process at CDE on whether or not to place implants. In the end, after the options have been fully and thoroughly evaluated, you can be certain Dr. Prus will make the best decision with you for your treatment. Precision in implant placement is greatly assured with CAD-CAM software programs which essentially eliminate human error. 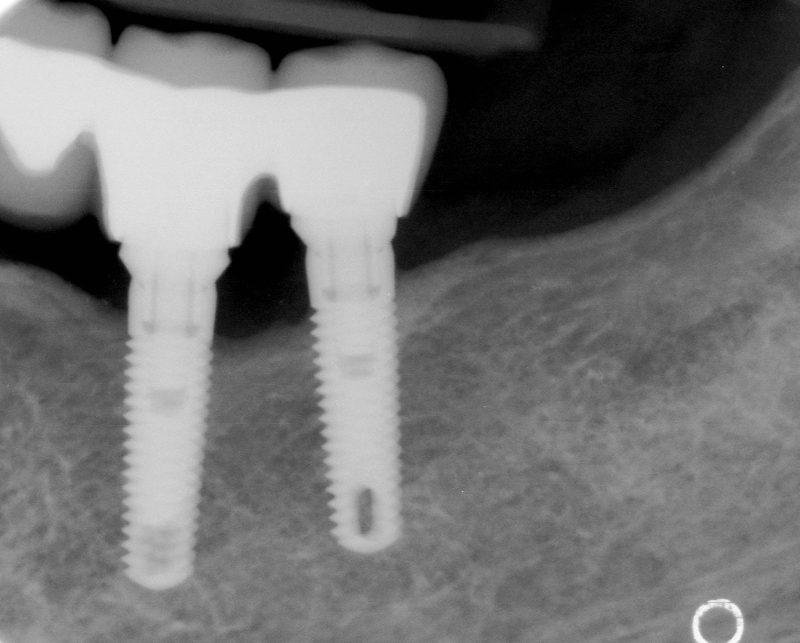 This is a significant benefit for the patient requiring multiple implants. The images and computer software allow total control of virtual placement of implants which is transferred to the mouth via computer driven templates that direct final, cosmetically idealized placement. Whenever possible, surgical guides that locate the precise placement of implants are utilized. 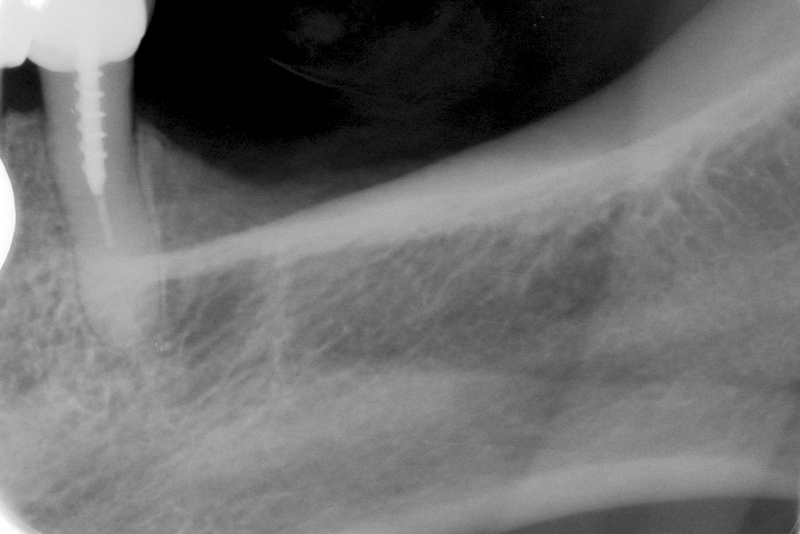 Bone location, density (needed for adequate implant support) and treatment planning are all determined before the work starts. Guesswork and human error is eliminated. Dr. Prus only works with CAD-CAM placement of implants. 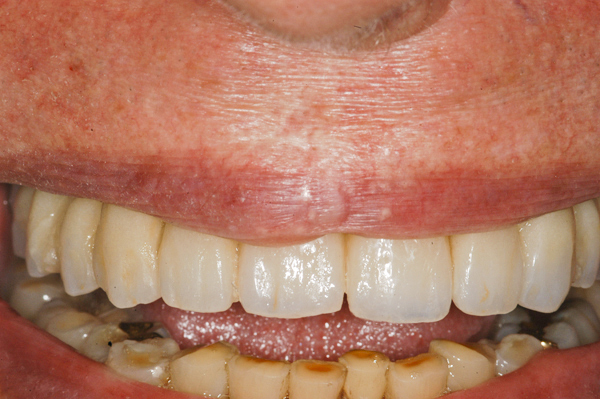 The denture can still be removed for hygiene purposes if it is not a screw down, fixed bridge, e.g. All on 4. 'All on 4' is a dental marketing phrase that means a full denture or full arch of teeth can be solidly and securely retained by 4 properly placed implants. 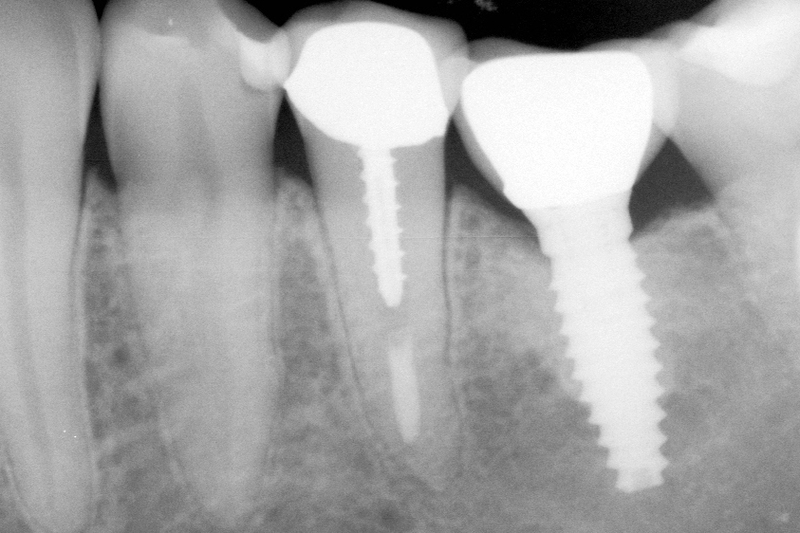 In actual practice the number of implants can be anywhere from 2 or more to complete the retention of the bridge. The bridge can be fixed or removable as circumstances dictate. 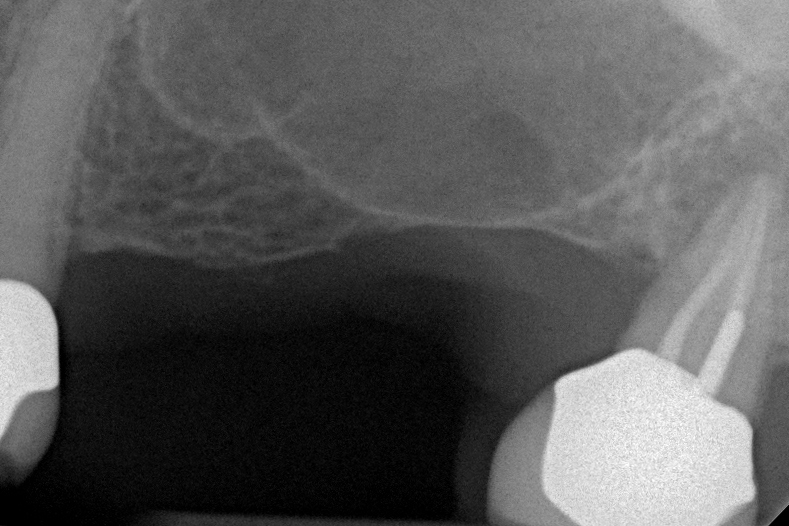 As shown above, bone quality and quantity are major considerations in placing implants. Lack of bone is not a contraindication to placing implants, but a bone graft will be required before the implants can be placed in the bone. 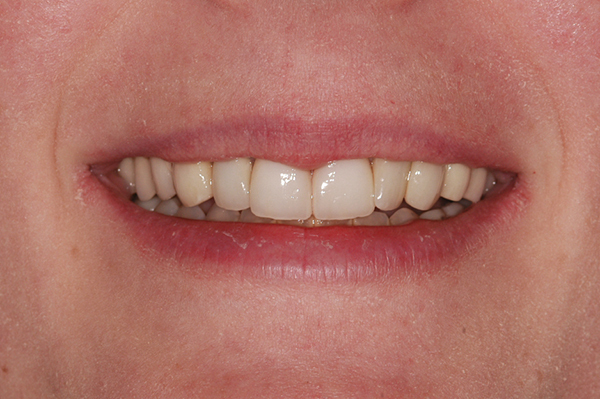 The more implants used, the more retentive and solid feeling the prosthesis: fixed bridge or removable denture. 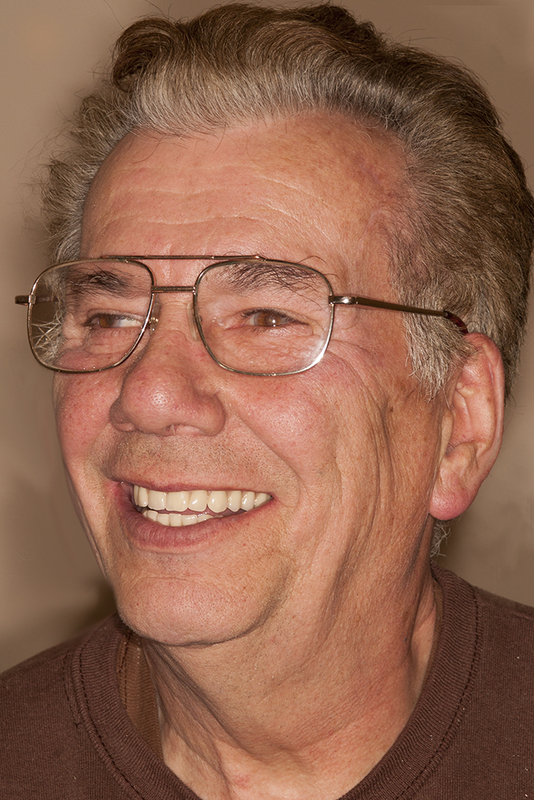 Implant supported full dentures are a concept that greatly improves the quality of life for those receiving them. This is especially so in the lower arch where there is no seal around the margins of a denture (the seal creates suction retention). 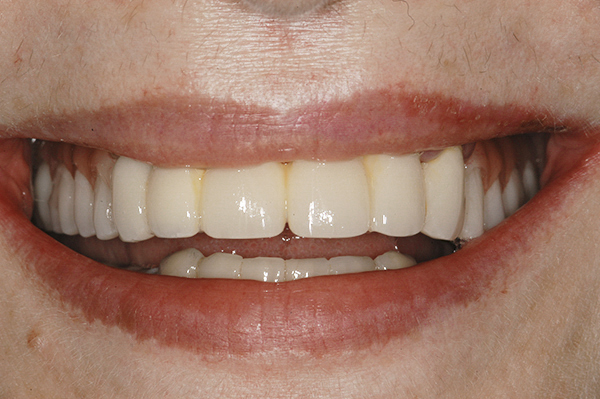 Dr. Prus restored his mother's lower arch, which had a full denture, with three implants at the age of 75. It is still functioning well twenty years later allowing her to eat any food she wishes. Advantages of a Pretau fixed bridge is that is less costly than a standard implant supported fixed bridge that utilizes crowns over a metal framework. The entire structure is designed on a computer and milled by a computer controlled machine (CAD-CAM: Computer-aided-design; Computer-aided-machined). This keeps initial costs down. Aesthetics are reasonable (see below) and because zirconium is strong, it is durable. Disadvantages are that it is computer generated. That requires that the settings on the computer, which are made by the lab, be very precise. 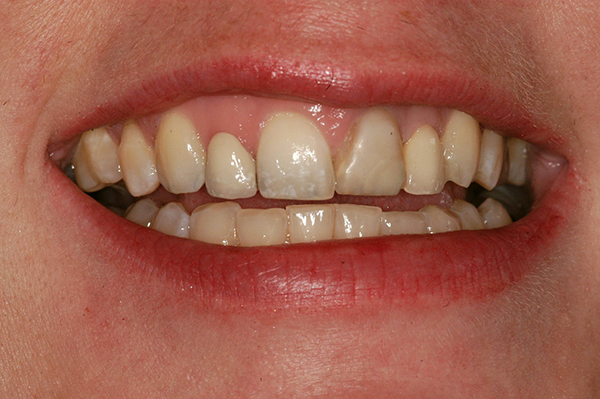 Blending a careful impression technique and verification jigs by the dentist with CAD can yield a very accurately fabricated prosthesis. Also zirconium, whether used as a standard fixed bridge or an implant supported prosthesis, is opaque and lacks translucency like a natural tooth, and it does not take up staining easily. 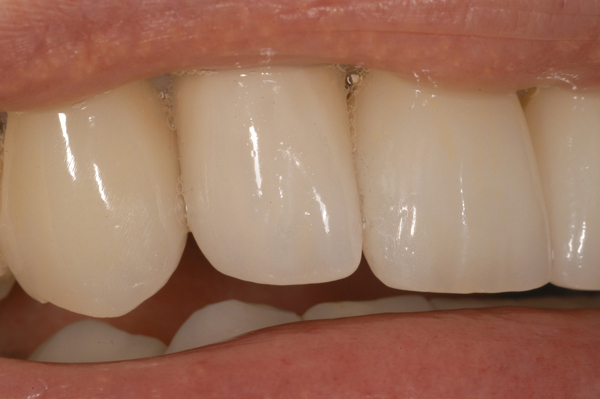 This reduces the aesthetic appeal of a Pretau bridge versus a hand layered porcelain over metal framework bridge. Your choice will depend on the values you place on aesthetics and initial costs. Zirconium is a very hard, thus brittle, material. A Pretau bridge is a single piece, zirconium construction; it cannot be repaired in any way. If there is a break or stress fracture from use, the entire prosthesis must be remade over again. While the likelihood of this happening is small, this can be a significant cost add on. The implants are returned for tryin with a plastic jig on each fixture with a small separation between each. These are carefully joined, then removed, then carefully reattached to the implants, one at a time, starting at the ends (each individually) to assure there is no wobble of the structure. Any wobble at this point will translate into constant pressure on the bone-implant interface and will cause it to fail, potentially damaging the entire structure. This applies to all implant restorative options. The milled titanium substructure(s) is (are) created and checked for perfect accuracy. Depending on the exact requirements for each case, these individual structures, which screw down to the implant fixtures, can retain the crowns or serve as a substructure for the next step. 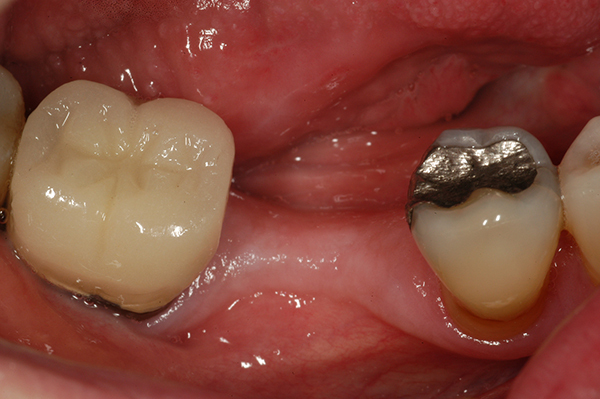 Subsequent bite registrations are taken and individual superstructures that retain the actual crowns are made in sections (2-3 per arch). This is the step that prevents a total remake of the bridge should there be a fracture. Any given section can be removed and a temporary replacement positioned until the repair is finished. It is also possible that an initial substructure can support and retain the same type of denture teeth and tissue replicas as with a full denture. This approach can be very aesthetic. This is a significant cost savings over a porcelain over titanium approach. Occasionally the teeth need repair and replacement just as with a denture. When costs are a primary consideration in choosing the best option for implant retained prosthetics, the least expensive approach is to use precision attachments (e.g. Zest locator anchors) which screw onto the implants which then retain by snap fit the full denture (Fig. 15). In each case it is always possible the full palate design can be discarded in favor of a smaller palate design, such as a horseshoe shape. The smaller design allows for more comfort, less bulkiness and better taste sensations. This can be made with or without a metal framework inside the denture. These are especially helpful for elderly patients suffering from poor chewing due to loose dentures. Case: a 'young' gentleman was looking for a better way to chew, smile, laugh, sing and everything else he enjoyed doing before dentures. By applying the protocols and techniques described above Dr. Prus provided him with a successful solution to all his requests. He was "Happy!" When a case is carefully planned and when there is sufficient bone of good enough quality it is possible to have your implants placed and teeth attached to them in one day (Fig. 16-19). Depending on the overall oral condition of the mouth, if sufficient stability is attained when placing the implants in the bone you can chew on them, with soft food restrictions, from the first day. 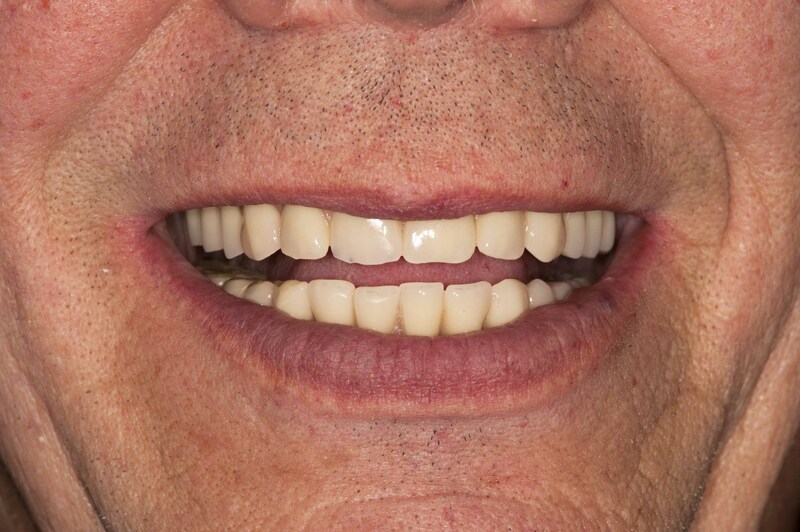 When Dr. Prus is creating full arch, implant supported, fixed bridgework he always tries to provide this service to his patients. With cooperation from the patients, it has always been successful. It is a great pleasure to the patients to be able to go home the very first day with teeth in their mouth being able to chew food. Depending on which arch (upper or lower) is involved the dietary restriction can last for 2-4 months. It is vital the implants become solidly integrated with the bone and excessive chewing forces may damage them. Care and good home care preventive protocols are the rule. Fig. 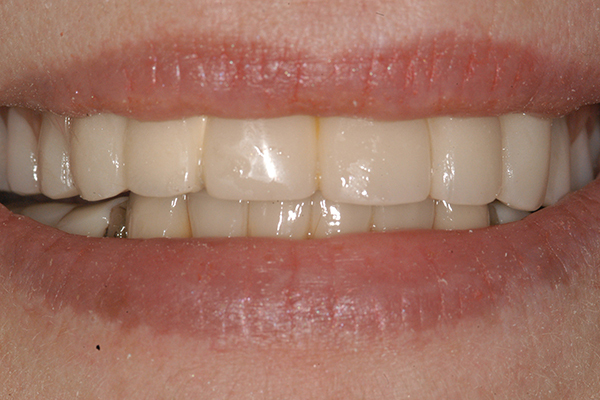 19 Final Porcelain fused to metal implant supported bridge. 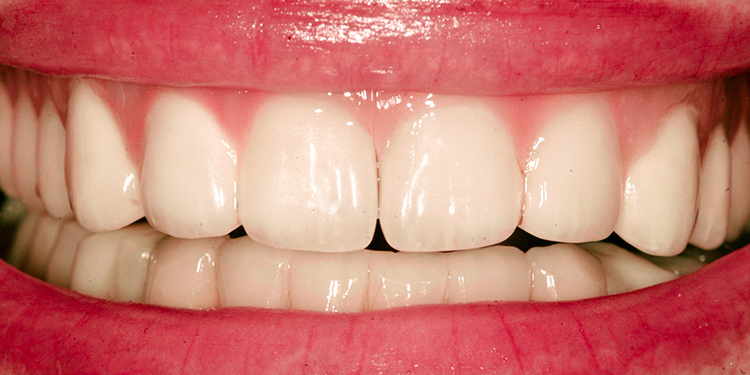 'Gingival tissues' are actually pink colored porcelain (10 years in mouth). Pretau bridgework is the contemporary equivalent. In partially edentulous arches (some, not all, teeth are missing) all the factors that are involved in placement of implants are involved. In cosmetic implantology there is no cookie cutter solution. Every case must be carefully analyzed and planned to achieve the best possible result (Fig. 20-23). 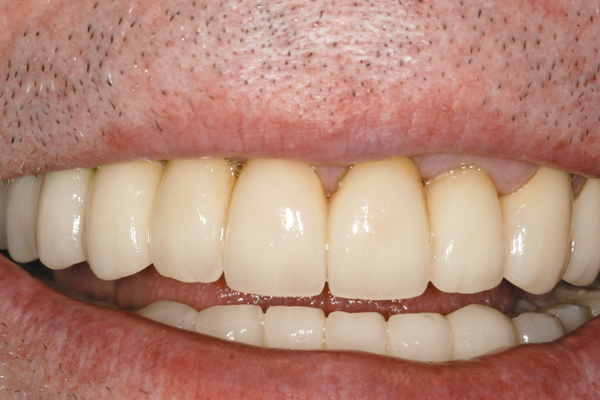 It is that attention to detail by both Dr. Prus and his master technician that makes Dr. Prus' work so successful. It is how he ensures your happiness with the final prosthesis. Implants are technically demanding. Dr. Prus does not assume that any implant is a 'no brainer' to place successfully. 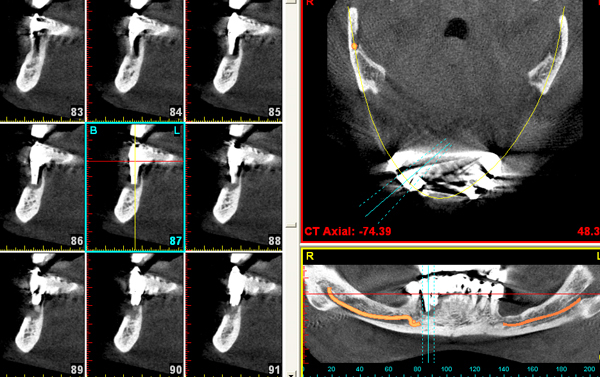 He insists on CBCT scans (dental Cat Scans) and computer generated surgical guides for all his cases. He has learned that when a case seems most obviously easy, that is where the problem will appear and he does not want that for you or any patient. Implants are the greatest invention in dentistry over the last 40 years along with dentin bonding. He wants the best of both for each patient he treats.